With their cheap price and easy preparation, instant ramen noodles are a widely eaten food. It's the perfect budget-friendly food, but let's admit it, they beg to be jazzed up both visually and nutritiously. 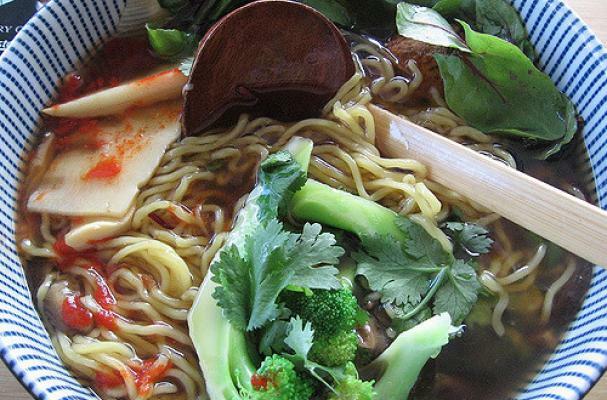 Here are some easy ways to take your instant ramen from ho-hum to wow in just minutes. 1. Replace the salt-loaded flavor packet with a healthier option. A scoop of miso (any color) dissolves in a flash, and is much better for you. Or, use less of the flavor packet, plus a bit of miso (both are salty, so take care to not overdo it). 2. Stir in some hot sauce! We love sriracha and harissa. 3. Add a dash or two of fish sauce or sesame oil - or both! 4. Bulk it up with greens like sliced green onion, fresh spinach, snow peas, cilantro, even leftover broccoli. 5. Ramen always needs an egg! Toss in a hard or soft boiled egg, or quickly poach, fry or even scramble one up. 6. Garnish with pickled or fermented vegetables like bamboo shoots, ginger, or kimchi. 7. Add a few shakes of toasted sesame seeds. When I was in college, and on a serious budget, my friends and I would combine the cooked ramen noodles and season packet (no water) with a box of mac and cheese and frozen peas. It may sound gross, but trust me, it's a sure-fire satisfying meal!